Radiation patterns of the corner reflector, spherical reflector, parabolic reflector, dual reflector, shaped reflector antennas can be obtained by SINGULA. 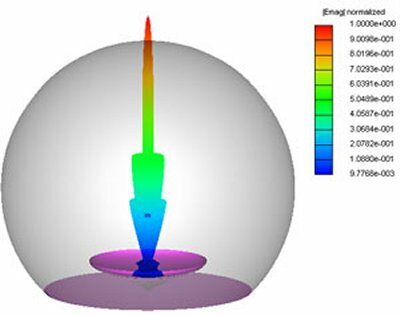 The effect of the presence of the conducting and non-conducting obstacles on the radiation patterns of the reflector antennas can be estimated accurately using SINGULA. Pyramidal horns, multimode horns, conical horns, corrugated conical horns, corrugated horns, dipole, and loop antennas can be used as primary feeds to the reflector antenna. The reflection coefficient of the feed as a function of the frequency can be obtained.